Hold the Corona Fastnet Short Film Festival in a small village that has no cinema. Build a village-wide intranet with high capacity for streaming video from a centralized server. The innovative “Distributed Cinema” proves successful and is embraced by all. The Corona Fastnet Short Film Festival was set up by a group of like-minded people who wanted to explore the creative and artistic talents that are so abundant in this genre. The first festival was held in May 2009. Two venues were used, the Harbour View Hotel in Schull Village and the Irish Cinemobile, a state of the art mobile cinema administered by the Irish Film Institute. One of the venues used during the first 2 years of the festival had closed its doors permanently and the use of the other went against the stated intention of the committee to invest in local infrastructure. The festival committee faced the challenge of holding a film festival in a village without a cinema. The committee, in association with John D’Alton, came up with the idea of “Distributed Cinema” and set about finding the expertise to make it happen. 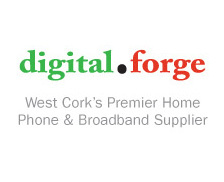 Digitalforge devised an intranet for the village of Schull, a pilot scheme to connect a large number of premises to a server enabling streaming of the short films to these premises, and the addition of wifi access allowed attendees of the festival to view short films of their choice, in venues of their choice. Nine venues are available for festival visitors to view films including 5 pubs, 1 restaurant, 1 craft store, 1 book shop and the Parish Hall. Digitalforge set up the new Linux server with Apache backend and 1Gb network interfaces. Both wired and wireless technology was used. The wired ethernet technology allows 1Gb network capacity . The Wifi network utilises 802.11 b, g and n protocols. Backup links are in place between the server location and the two most important venues. The 2011 Corona Fastnet Short Film Festival has been a wonderful success, even more interesting and challenging than in previous years. The guest speakers, attending filmmakers, sponsors, tourists and locals all had a wonderful time and the overall consensus was that “Distributed Cinema” was a very inclusive idea that suited Schull and embedded the festival into the local community in an innovative way. The Film Festival Intranet was completed with the help of Brendan Hurley of DigitalForge, West Cork Development Partnership, Granite Consulting and Martin Levis. The most remarkable thing was how the technology disappeared leaving simple access for the audiences and the filmmakers. They used that access in ways that we had not anticipated by becoming interactive with it, showing their films, discussing techniques and comparing ideas. The venues became places of spontaneous workshops with groups of filmmakers showing their films, drinking coffee, getting feedback and comparing notes. The network remains in place for visitors to log on to and view the submitted films throughout the village of Schull. Visitors to the village can pop into the book shop, one of the pubs or restaurants, take out their laptop, smart phone or iPad and enjoy the competition films at any time.